The 2013 SEMA Show in Las Vegas is quickly approaching and the Chrysler Group has issued up the first teasers of what will likely be one of the biggest displays at the show – giving us an artistic look at just four of the 20+ vehicles that will fill the huge Mopar display. While these freshly introduced SEMA Show Chrysler Group teasers don’t come with any information shy of the brief quote below from Mopar boss Pietro Gorlier, we can offer some speculations as to what these vehicles are and what they could be in terms of the level of customization. Keep in mind that Mopar promises that the 15,300 square foot indoor display will have 20 vehicles that have been modified with Mopar accessories (and like some accessories that are not available yet). We can expect to see everything on display with a custom look from the Fiat 500 to the Dodge Charger to the mighty SRT Viper and today, we get a look at artwork of four of those Moparized vehicles. 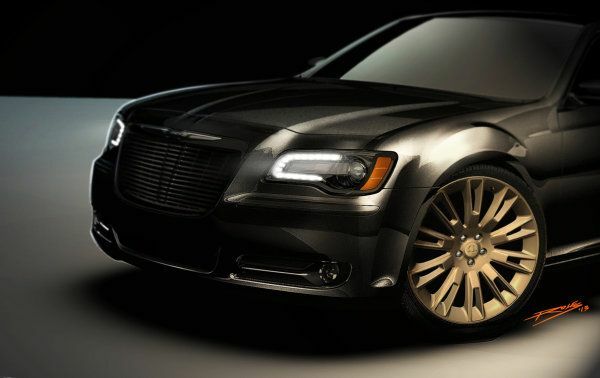 First up, we have a 2014 Chrysler 300 that looks to possibly be based on the 300S package (shown above). Based on the ride height relative to the Mopar 20 inch wheels that have been painted gold, it looks like this car has a suspension package of some sort but it’s hard to say what else might be special about this SEMA Show Chrysler. If I had to guess, I would expect a 5.7L Hemi V8 with a Mopar cold air intake and an exhaust system with a Katzkin leather interior upgrade – among the long list of modifications. 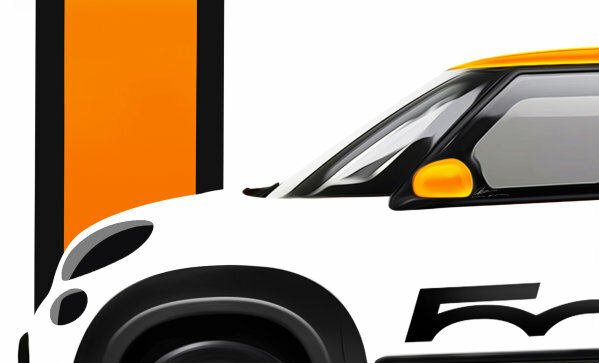 Next up, we have a very minimally informative piece of artwork that shows a modern Fiat product and I believe that this is the Fiat 500L based on the headlight shape, the black wheel opening trim and the shape of the windshield. I would guess that this car will have a dressed up interior, custom wheels and some minor performance mods like a cold air intake, exhaust, braking and suspension components. 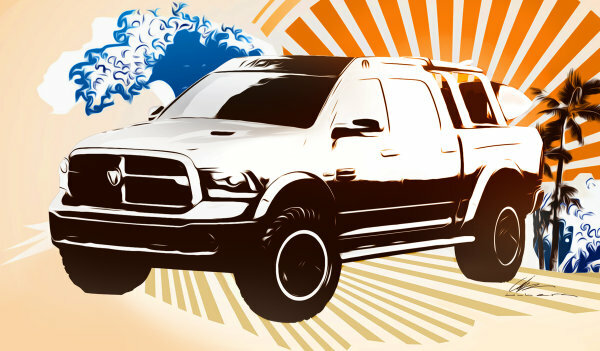 The third Mopar teaser image shows a 2014 Ram 1500 portrayed old school beach faring style. This truck has some obvious modifications like the Mopar cargo rack that starts on the roof and extends out to the tail gate, some beefy tires wrapped in bead lock rims and a lift kit to make clearance for those big tires. This truck also appears to have some larger wheel opening flares and as is the case with everything else at SEMA – I would guess that this Ram 1500 will also have a Mopar cold air intake, Mopar exhaust and a purpose-designed interior. Finally, we have a closely cropped rendering of what is very obviously the 2014 Jeep Cherokee that I believe is a modified Trailhawk model. 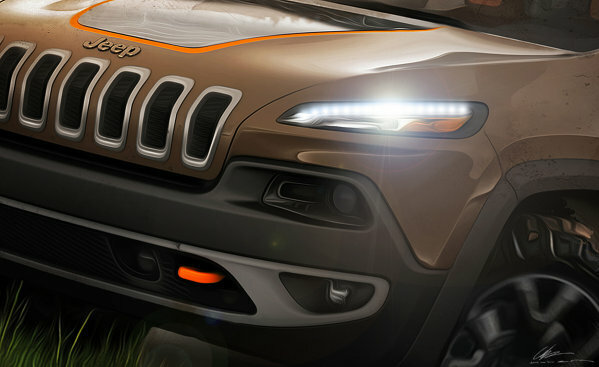 The Cherokee has been heavily delayed after being met with quite a bit of controversy over the distinctly designed front end but with Mopar making a bigger push into the offroading market – we can expect this new Jeep to be clad in Mopar goodies that would make it a more legit offroad beast.